Solar system on a multi-family building in Washington, D.C. Direct ownership means the building owner will purchase the system for their property and will own all of its electrical output. Direct ownership of a system makes sense if you have cash up front, access to financing, or wish to keep incentives like the federal tax credit or Solar Renewable Energy Credits (SRECs). Under third-party ownership, a separate entity, such as a solar developer or a group of community investors, owns and operates the solar system on behalf of the organization. The organization then pays the third-party for the monthly electricity produced by the solar system. Many condos and multi-family buildings prefer third-party ownership. This is because third-party ownership is simpler and does not require the building to manage the federal tax credit or other incentives. Additionally, the third-party owner would cover any maintenance that the system needs. Third-party ownership is only available in certain states. Find out where. Unlike with a single-family home, where the solar system is connected directly to one electric meter, adding solar to a multi-family building can be more complicated. This is due to the building having multiple electricity meters, shared roof space, and many decision-makers. Solar systems can be sized to power a percentage of a building’s electricity use, offset usage in common spaces, or provide power for electric vehicle charging. The easiest option for going solar in a condominium or multi-family building is to use the solar system to offset electricity usage in common spaces for elevators, lighting, and HVAC systems. This approach will work if the building is master metered or is separately metered with an electric meter for the common spaces. By offsetting the electricity usage in the building’s common areas, all participants in the building benefit equally and the payments for the system can be easily rolled into the periodic assessment (‘condo fee’) or financed by the condo association. Another option, if available, is a [power purchase agreement to avoid any upfront payments. 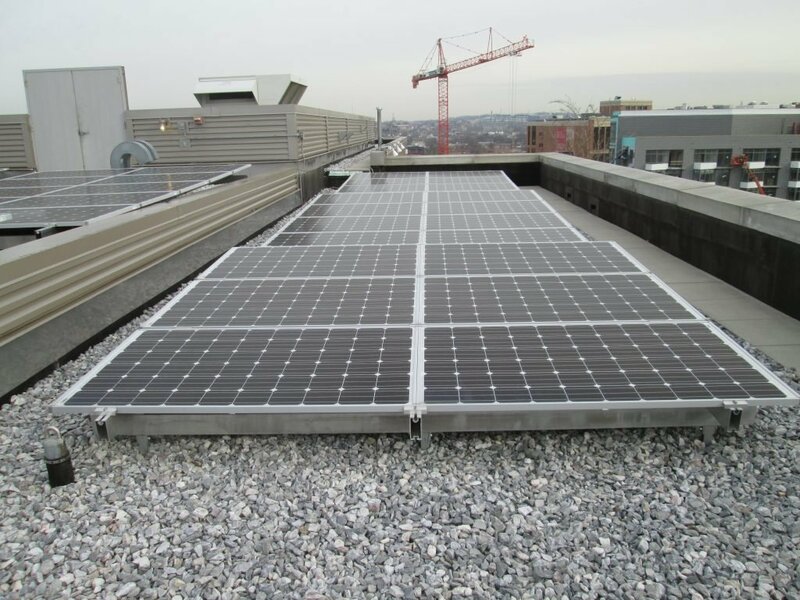 If the cost of paying for the system is less than the savings on the common area electric bill, solar can be a cash flow positive decision for a condo from day one. 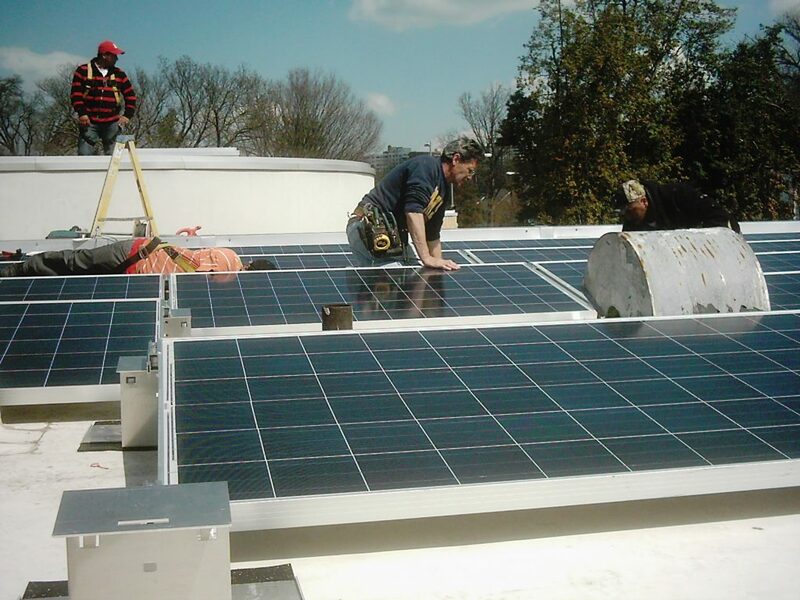 Solar panel installation on a commercial building in Washington, D.C.
A solar system can be connected to the electric meter of a single unit. It could also be connected to a select number of the apartments in a multi-family housing building with units that are separately metered. The individual unit owners will own the system and enjoy the benefits of the solar system. The advantage of this approach is that only the individual units interested in going solar will participate in and pay for the system. This has very little impact on non-participants. The downside is that only certain individual units will benefit from the solar system installed on a shared roof. This approach may still require condo board, co-housing association, or other decision-making authority approval. This is particularly true if the roof is shared by multiple units. It is therefore critical to be proactive in learning about the procedure or precedents for approval regarding solar and working to educate the decision-making authority about the benefits of solar. If your building has a central water heating system that provides hot water to all the units in your building, another approach is to install a solar thermal system to lower the costs of heating water for all the building’s residents. A solar thermal system can be a cost-effective way to help heat your building’s hot water. It is a good option if you don’t have enough space for a large solar photovoltaic (PV) system. Learn more about solar thermal technology. With this approach, individual units can get a portion of the solar system’s production credited to their electricity bills. For example, you could install a 50 kW system on a roof and divide up the system’s production among all of the units, or those that elect to participate, with each getting proportional credit for the solar energy produced on their utility bill. Unfortunately, this approach only works if community solar/ virtual net metering legislation is in place. Learn more about community solar and whether it’s an option in your state. Know who the decision makers are: Your condominium association or multi-family buildings have a number of different important decision-makers including building owners, real estate developers, building managers, and boards. Convening the appropriate decision-makers is vital to moving forward with any solar project. Typically, it is best to have a point person leading the project, conducting research, and presenting findings to the rest of the stakeholders. Co-op member showing off his solar production. 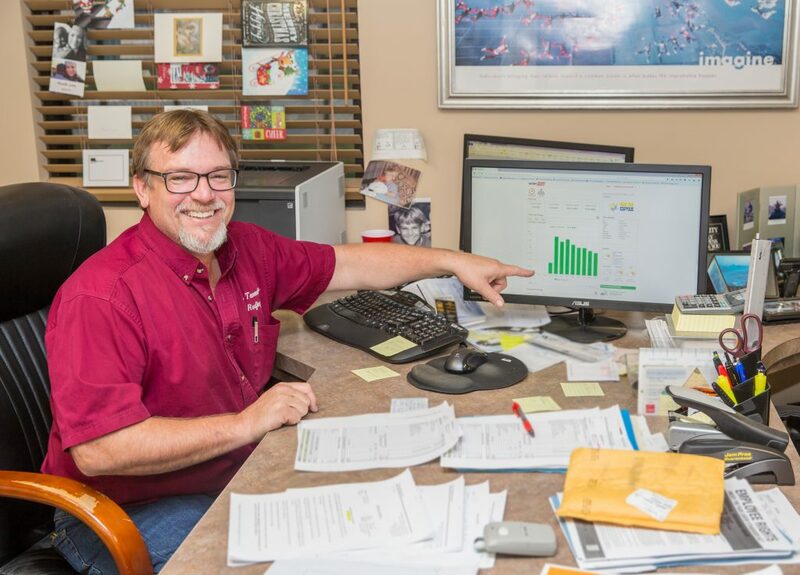 Find the project model that works best for you: Electricity usage and set-up in multi-family buildings can vary widely. In some buildings, individual tenants or condo owners pay electric bills, while in others, those costs build into condo fees or monthly rent. Additionally, some properties have fees or other funds that can be allocated to building upgrades and improvements. It is important to think about these factors when considering solar. There is no one best way to go solar. But in each case, the right decision-makers will need to carefully consider what will work best for each building. Can Do—Even in a condo: How to go solar – A profile of how one Chicago couple took their condo solar. Solar installations in condominiums – A useful guide to some of the key issues to consider when adding solar to a condo building. Condoizing solar – One woman’s research on condos with solar around the country.